Math is a great subject. It increases your ability to solve problems fast. But many people fear from the name of math. Because math is not an easy subject and its problems are so tough that a person without teacher’s help can’t solve it. But sometimes you don’t have any person who guides you in solving a problem. Today the technology is so advanced that you can solve any problem with the help of internet. There are thousands of apps available in the market that helps you solve problems both for windows and mobile phones. 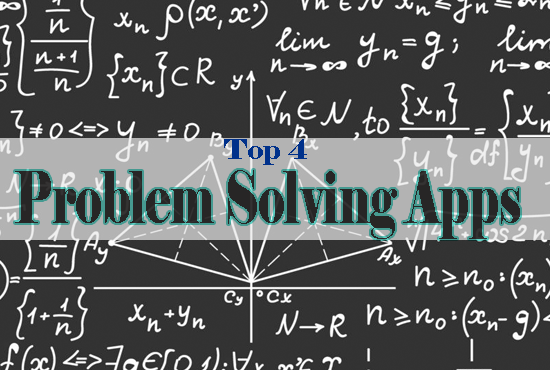 Now I will be going to tell you about the best problem-solving apps. These are just like a math calculator with steps. There are much other math solvers online but sometimes you don’t have access to the internet so you can solve problems offline with these math calculators. Today people study various subjects to get high marks in the exams in order to get a good job. But many people face difficulties in solving their problems, mathematics is also in the category of the toughest subjects and it is disliked by the majority of people, but remember if you don’t know math you are nothing. But don’t worry technology had made it easy for you to learn and solve problems easily. Now I am going to list Top 5 android apps that are available for Android and IOS device too. Photomath: Both For Android and IOS. The app in the top 5 list is the photomath app. This app solves the problems in an easy way. You can solve any problem just by scanning the question with your mobile phone camera. Once you scan photomath app will process it and show you the step-by-step solution to your problem. integers, decimal numbers, algebraic expressions, linear equations/inequalities, quadratic equations/inequalities, roots, integrals, systems of equations, derivatives, fractions, arithmetics etc. It has also a feature of graphs that you can use to check the graphical representation of equations. This app is also similar to photomath app and solves the problem in a similar way to the above app solves. Cymath also has a web version of it that is Cymath.com. Similarly, you can scan the problem on your notebook or from anywhere or you can simply enter the equation or whatever the question manually by using the mathematical keyboard provided by them. Once the app scans the problem it will solve this and show you the step-by-step solution to the problem on the display screen. by partial fraction, substitution, equation solving, factoring, logarithms, quadratic equations, rationalizing, trigonometry, partial fraction, quotient rule, chain rule, integration trigonometric substitution, etc. Snapcalc is just available for IOS devices only. It can also solve the problems similar to the others. You can scan the question by using your device camera or you can use their mathematics keyboard to enter the data like you do in Cymath app. When the data is entered the Snapcalc will process it and show you the solution of the problem. iOS users can download SnapCalc app from Download Here. It also has graph representation facility. You can use it to check the graphical representation of your functions, equations and other problems. Android users can download MalMath app from Download Here. These are some of the best-known problem-solving apps, Available for Android and IOS devices also. You can use whatever you like the best, that can help you solve your problem in the best way. If you have any questions ask in comments. Thanks.